Housing markets out west are on fire. Prices are rising, supply is tight and competition among buyers is fierce. That’s all good news for homeowners. Not so much for buyers. Home prices have risen faster than wages in many cities, creating an affordability issues for buyers — especially first timers. “Everything from the Rocky Mountain states and west from there are doing much better than the rest of the country and it’s been like that quite consistently,” said Lawrence Yun, chief economist at the National Association of Realtors. Seattle, Las Vegas and San Francisco are leading the way with annual double-digit home price gains in March, according to the latest S&P CoreLogic Case-Shiller Indices. Nationwide, price rose 6.5% during that period. Seattle has now seen nearly six years of positive annual price gains, with 27 consecutive months of double-digit gains. During the peak years before the housing boom, it was the sunbelt states that were dominating home price appreciation, noted David Blitzer of S&P Dow Jones Indices. “Following the technology collapse in the stock market in 2000, people saw owning a house as a great investment, better by far than the stock market. The Sunbelt had an attractive climate, available land and reasonable housing. Job growth was less of a factor,” he said. But now it’s the rise of the tech sector that’s helping to drive the surge. Strong economic growth and job creation are two main drivers of price increases. As good jobs bring new residents to a city, the strong demand for housing pushes prices up. Many markets on the West Coast have the trifecta right now. The tech boom has created strong talent pools, local economies are booming and there’s not enough housing to fill the demand. Taxes could also play a factor in people moving west, according to Nela Richardson, chief economist at Redfin. Washington state doesn’t have an income tax, and Proposition 13 in California has reduced property tax rates on homeowners. Low inventory means homes are selling fast, with West Coast buyers facing the toughest conditions. Denver buyers have to act the quickest: half of all homes were pending sale in just six days in April, according to Redfin. Homes in Seattle spend a median of seven days on the market. The number increases to nine days in San Jose, California, and Tacoma, Washington. 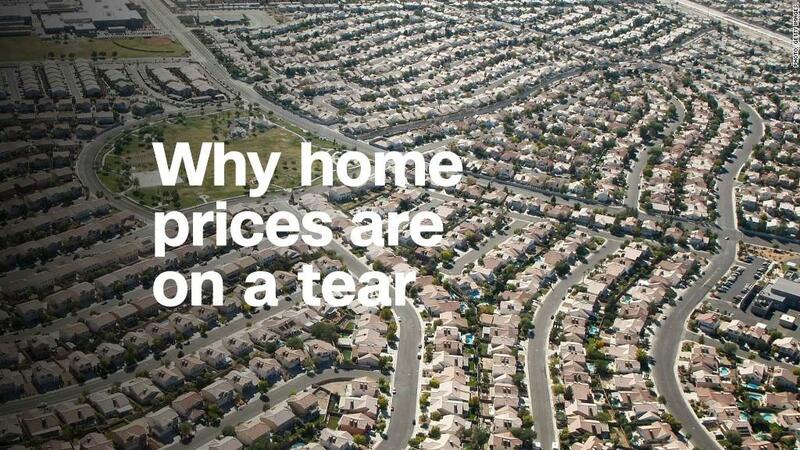 Rising home prices have been a boon to homeowners. Nationwide, the average homeowner gained $ 16,300 in home equity from the first three months of 2017 to the same time this year, according to a recent report from CoreLogic. Owners in the West saw the largest increases. California homeowners got a bump of $ 51,000 in home equity, on average. And in Washington the average increase was around $ 44,000. When prices become too high they can push people to move to cities with more affordable housing. High prices can also cause businesses to relocate or re-think plans to open shop.